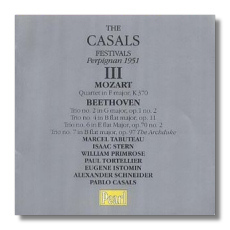 Variations on "Bei Mannern" from Mozart's Die Zauberflöte"
Volume II is dominated by Casals the conductor. He compensated for his lack of "stick technique" with his demand for exhaustive rehearsals. Casals didn't lead the orchestral musicians as much as he taught them. He educated them about the music and about the nuances that made it come alive – articulation, phrasing, and the expressive manipulation of tone, to name three. At least at Perpignan, his tempos tended to be on the slow side. The tempos themselves didn't make the musicianship profound, although they certainly helped. Here, the best of the three concertos is the Sinfonia concertante with young Isaac Stern and the more veteran William Primrose. Both were at the peak of their powers, and this performance could hardly be more fulfilling and divine. Morini, a cult violinist, seems a bit off her best in the "Turkish" Concerto, and Wummer's version of the Flute Concerto is a little too rich for my tastes. 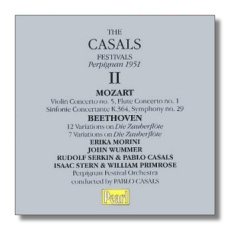 The two sets of Beethoven variations go very well, as Serkin spurs Casals on. Volume III is devoted to four of Beethoven's piano trios (Istomin, Schneider, and Casals) and to Mozart's Oboe Quartet (Tabuteau, Stern, Primrose, and Tortelier). Again, Casals the cellist is that much more compelling when he has a young heart beating beside him – Istomin was only in his mid-twenties during this Festival. The music-making is almost regal in its bearing, and one could argue that this is somewhat missing the point, where Beethoven is concerned. Certainly, one needs to go to Panenka, Suk, and Chuchro (for example) to find more idiomatic playing, but the present line-up plays as if they wish to transcend time and space. Producer Roger Beardsley includes a brief note in the booklet in which he makes few excuses for the sound quality. "These are wonderfully vivid recordings made at live performances," he writes. "Any faults that cannot be corrected are minor." I don't agree. I've heard many 1930s-vintage 78s that sounded better than this. The chief problem here is the high level of distortion. It is particularly damaging to the piano, whose tone is made to curdle at anything louder than a mezzo forte, but it affects all of the instruments. I don't know the cause of the problem, but it sounds a lot like the result of using a dull stylus to play an LP. It is a shame that this fault gets in the way of the music. Not strictly a technical problem, Casals's moans and grunts (the auditory equivalent of the grimaces to which cellists seem to be especially prone) have the potential to become an irritant, over time. These are absolutely "classic" readings, but I don't think I could recommend them to everyone without qualification. If it's the music you want, there are some safer alternatives. If you're interested in the Casals legend, and in divining the difference between personality and ego, then go for it.